Santa came late! Best bow buck to date!! A week before rifle season opened up here in OK, a buck showed up at my house that got my attention really quickly. I had a pretty decent little herd of resident does that lived on my place and several nice young bucks, but nothing to get excited about this year. Anyhow, we live just right outside of town and have 27 acres of basically all pasture ground with one small strip or trees running thru our place that connects to a cedar thicket on the neighbors that the deer live on that's about 15 or so acres big, that's surrounded by several houses and a small housing addition across the road. I'd gotten Word that the neighbor had seen a big buck across the road and they were after him, but I had no idea that it really was a big deer until I saw him for the first time standing in front of my cattleguardcattleguard one night when I was coming in from hunting. From that night on, I got pictures of him every single night, and about every three or four days he would slip up and come out in the daylight. I had a narrow but long food plot planted on my place, but with lack of rains, it did not produce very good so the deer mowed it down pretty quickly. As soon as I knew he was in the area, I started putting out corn periodically just to give them a little something to eat other than cedar and pasture grass which is all we have around here. My wife set for him several evenings with no luck, as did I, and finally over the last couple weeks I started seeing him slowly but surely coming out a little by little closer to shooting light and coming on to our place. I've been hunting with my long bow all season, but with the season drawing closer to an end, I finally pulled my compound out for the first time in several years. What really prompted me to do so was the buck had come in and stayed just out of range about a week ago and never presented me with a shot that I felt was ethical, and after seeing him multiple times afterwards I knew my chances were slim to none with my stickbow with the season drawing to an end. I can only hunt the spot with an east wind due to where he came from, and this time a year we don't get many east winds with it being winter time, so that made it even tougher to catch the conditions are right. Finally last night on Christmas, he made his appearance shortly before dark and slowly made his way in to my set up. The buck turned to head my way and stopped broadside At about 24 yards and I wasn't letting him get any closer. I drew back settled my pins, or what I could see of them in the dark blind, and let the arrow fly. I honestly had zero clue if I had hit or missed him as I didn't hear the normal "think" of the arrow like I do with my trad bows. The buck and his running buddy bolted away, and I jumped out of the blind and crawled up onto a cattle panel to see if I could spot them out in the tall grassy field. After about five minutes, I could barely see him but I spotted the small buck making his way out of the field the big buck was not with him. Still not feeling 100 percent confident, but but feeling much better about the big buck not showing himself, I went to the house and hung out for an hour before going back out and looking. Upon arriving, we found my arrow covered in blood, but very little blood on the ground. We tracked for about 30 yards in the waste to head high prairie grass before backing out and calling a friend of mine with a dog. I was skeptical at first the way the dog acted but finally she got on a trail that looked halfway promising and a bout 150 yards later, she stopped altogether as she had found my buck. Honestly, I still can't believe it all happened the way that it did. Had I not called the dog in, I highly doubt we would have found him last night, and there is a good chance that we may not have today unless we would have walked right up on him as thick and tall as the grass was. I truly feel honored and blessed to have gotten a crack at this guy and get him on the ground, and on Christmas Day to top it off! It will definitely be a Christmas I'll always remember! He has 12 score able points, but I've still yet to tape him out. Will keep y'all posted once I do. Hope everyone had a very Merry Christmas an has a blessed upcoming New Year! Heck of a cool buck. Big congrats to you!!! Awesome bowhunting story and kill. Congrats!! That dude is huge! Congratulations! Fantastic buck. Congratulations and thanks for sharing!! Man, he's got some tall antlers. Nice buck, congrats! Congratulations man, that is a stud! That is a very unique deer, I love it..congrats on a special xmas deer..
That is a tremendous deer. Congrats! Also...great write up. Thanks! What a great story. Thanks so much for sharing your hunt and respect for such a magnificent animal. You shine a great light on hunters. Merry Christmas to you! That is a very cool, very big buck. Yes sir, first time I saw him I thought he would be an east Texas hunter's nightmare. I stretched it as far as I could and he's 12 6/8" wide. He rough taped out 157 6/8". Thanks all for the congrats. It's been a long season with lots of hunting and lots of close calls, so this was definitely a heckuva way to end the season! One of best hunting stories I have read anywhere, patience, planning, and execution of plan. You sir are a Great hunter! Wallhanger, for sure! Very nice buck. Can’t believe he didn’t bleed more, looks like you put an excellent shot on him. Holy crap. Looka bases on that guy. Congrats on the hard work and dedication dude ! Right on! 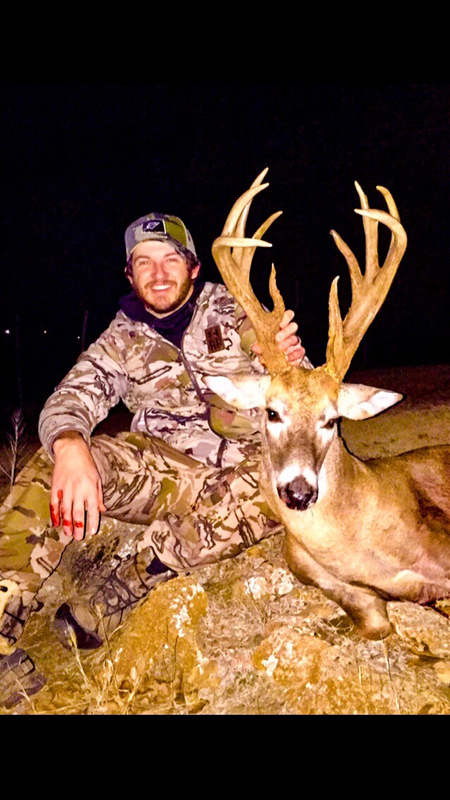 Great story and awesome buck!! Love that mass! Awesome buck. Love the character! Have you shared the news with your neighbor that was hunting this deer? ....might b good closure for them ! Haha.